Preheat the oven to 230°C, gas mark 8. 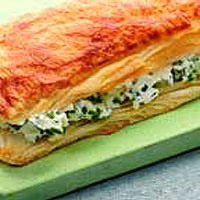 On a floured surface, roll out a 375g pack ready-rolled puff pastry into a square measuring 38cm x 38cm. Slice down the middle and trim the edges, if needed, making two equal rectangles. Brush with beaten egg and bake on a heavy baking sheet for 10-12 minutes or until golden. Allow to cool. Meanwhile, mix 500g Mascarpone with the juice of half a lemon and a 15g pack of chives, chopped. Spread one of the pastry rectangles with a 2cm-thick layer of the Mascarpone. Top with the other pastry rectangle, and serve as part of a summer tea.